Moller et al. (2008), in an article on e-learning in higher education, observed that ‘E-learning courses can carry a certain “stigma”’ (p68). In August 2010 the Society for Human Resource Management- ‘the world’s largest HR membership organization devoted to human resource management’- conducted a survey amongst Human Resource managers to investigate the common perceptions companies have towards online degree holders when considering them for employment. 49% of respondents affirmed that job candidates who achieved their qualifications online are viewed less favourably than their counterparts who have studied through traditional, face-to-face instruction. In addition, 16% of respondents were not sure (Society for Human Resource Management, 2010). It would appear that the ‘stigma’ Moller spoke of was borne out in these results. In this reflection on my studies of Distance Learning I will consider why society can tend to take an unfavourable view of online studies and what is happening that can change these prevailing sentiments. One of the keystone principles of distance learning and, by extension, online learning, is Equivalency Theory. Equivalency theory posits that studies at a distance should not be identical to face-to-face education but that ‘equivalent outcomes… should be expected of each learner’ (Simonson et al. 2012, p. 52). For online education to be considered a mode of education worthy of respect in and of itself, and not merely as a poor alternative to traditional studies, ensuring that equivalent learning outcomes are achieved is vital. Simonson et al. (1999) explain that Equivalency Theory is ‘central to the widespread acceptance of distance education’ and if ‘equivalency is not what the public perceives, then distance education will continue to be peripheral to the field of education’. The survey by the SHRM cited in the above paragraph strongly suggests that, despite Equivalency theory being central to the development of online studies, and despite research suggesting that equivalency in learning outcomes is very much achievable through online learning (Lapsley et al., 2008; Webster and Lennon, 2007), there is a social perception that learning in online courses is not equivalently effective to traditional course studies. There is, however, a positive trend developing in social perceptions towards online education. Allen and Seaman (2013), in a study tracking perceptions towards online studies in the US over a ten year period, demonstrate clear quantitative evidence that social perception of online education is becoming more positive with time. Although close to 25% of Chief Academic Officers at higher education institutes in the US felt online studies were inferior in some ways to face-to-face education, this percentage has almost halved since the surveys began in 2003 (p28). Allen and Seaman make one particularly fascinating (for the sake of this paper at least) observation from their data: ‘A consistent finding over the ten years of these reports is the strong positive relationship of academic leaders at institutions with online offerings also holding a more favourable opinion of the learning outcomes for online education’ (p29). This suggests that individual perceptions of online education are very much influenced by the level of exposure to online education that the particular individual has had. With the increasing popularity of MOOCs and the rise of the numbers of people who are studying or training through online learning it stands to reason that the level of acceptance of online studies will also continue to rise. It has been posited that distance education will soon reach a stage of critical mass, the stage where distance education will be ‘expected and respected’ at large; not just an alternative to traditional education, but an equal (Laureate Education, n.d). In conclusion, I believe that the ‘stigma’ Moller et al. mentioned being attached to online education persists, but it is on the wane. I believe the evidence points strongly to the fact that within the near future online education and training will achieve a point of saturation high enough to make its equivalence with traditional studies a generally accepted norm for this type of learning. As an instructional designer of online studies, there is a constant responsibility to represent the very best of what online education can offer distance learning students as a viable alternative to traditional studies. Designers should make every effort to ensure that students studying online have the best learning experience possible, and just as importantly, the most equivalent experience possible. For example, although it has been well documented that interaction between students and instructors is critical for developing a meaningful learning community and promoting transformational learning in online learning (Murphy & Cifuentes, 2001; Schmidt and Gallegos, 2001) one of the oft-perceived weaknesses mentioned by potential students of online education relates to lack of interaction with instructors and isolation from classmates compared to studying face-to-face . Schmidt and Gallegos (2001) are very clear on how important interaction is for distance learning students: ‘When developing a distance delivery course, course designers must provide a way for students and instructors to interact’ (p5). Ensuring that such interaction is accounted for in online instruction is an example of how instructional designers can ensure that positive perceptions of online studies are fostered. The proliferation of people studying online and having positive experiences while doing so is a crucial step in online education reaching the ‘critical mass’ that Dr. Simonson referred to. Personally, my ambitions for online education are focussed on the education sector. I believe that online education will reach the stage of ‘critical mass’ within the next decade, and at that point it will be incumbent on universities and institutions to embrace online education as an equal to their campus studies, or else face the prospect of being left behind by their competition. Once this stage is reached there will be a demand for workers with expertise specifically in distance and online education to ensure that equivalency to the traditional courses is ensured in new online study programmes. In the more immediate future I, and every other worker in the online education industry, has a certain responsibility to safeguard the reputation of online education and aid the advance towards general societal recognition of its value. Allen, I. & Seaman, J. (2013). Changing Course Ten Years of Tracking Online Education in the United States. United States: Babson Survey Research Group and Quahog Research Group. Lapsley, R., Kulik, B., Moody, R., & Arbaugh, J. (2008). Is Identical Really Identical? An Investigation of Equivalency Theory and Online Learning. The Journal of Educators Online, 5(1). Laureate Education. (n.d.). Theory and distance learning. Retrieved November 9, 2014, from https://class.waldenu.edu. Lennon, J., & Weber, R. (2007). Multi-Course Comparison of Traditional versus Web-based Course Delivery Systems. The Journal of Educators Online, 4(2). Moller, Leslie, Wellesley R Foshay, and Jason Huett. (2008). “The Evolution of Distance Education: Implications for Instructional Design on the Potential of the Web.” TechTrends 52 (4), 66-70. Murphy, K., & Cifuentes, L. (2006). Using Web tools, collaborating, and learning online. Distance Education, 22(2), 285-305. Schmidt, E., & Gallegos, A. (2001). Distance learning: Issues and concerns of distance learners. Journal of Industrial Technology, 17(3). Simonson, M., Schlosser, C., & Hanson, D. (1999). Theory And Distance Education: A New Discussion. American Journal of Distance Education, 13(1), 60-75. Simonson, Michael, Sharon Smaldino, Michael Albright, and Susan Zvacek (2012). Teaching and learning at a distance: foundations of distance education. Boston, M.A: Pearson. Society for Human Resource Management. (2010) Hiring Practices and Attitudes: Traditional vs. Online Degree Credentials SHRM Poll. Retrieved December 19, 2014, from http://www.shrm.org/research/surveyfindings/aspx. In this guide I will look at 5 areas that should be considered of high importance when developing a hybrid learning instruction, with a particular focus on a scenario where a face-to-face course is in the process of being converted to a hybrid learning instruction. These five areas, if dealt with appropriately, will help increase the effectiveness of learning for distance education students. What is hybrid learning and what are its advantages? An understanding of the benefits of, and theories behind, distance learning is important for anyone looking to develop distance learning instruction as it can inform their decisions about whether distance learning is indeed a suitable choice for the specific case and influence choices to be made in the design of the instruction. Hybrid learning (or blended learning) is distance learning that occurs when instruction is offered partly through traditional face-to-face learning and partly through distance learning. It is suggested that if up to 80% of the studies are delivered through distance learning with the remainder offered through traditional methods then hybrid learning takes place (Laureate Education, n.d.a). Distance learning means that ‘interactive telecommunications systems are used to connect learners, resources, and instructors’, so hybrid learning offers all parties the opportunity to partake in study without having to be physically present in the same space (Simonson et al., 2012, p.32). Having a distance learning aspect to instruction can be preferable to solely face-to-face learning for various reasons. The biggest advantage with hybrid learning is that it offers a higher degree of flexibility to students and instructors. There are also other practical advantages for institutions offering courses where not all students are required on site at all times. If students partake in some parts of a study programme from a distance instead of requiring face-to-face instruction 100% of the time, ‘you don’t need to have as many classroom buildings, you don’t need have as many parking spots, you don’t need to have as many, maybe even, dorm rooms’ (Laureate Education, n.d.b). Finally, distance learning can, in and of itself, also be a very rewarding means of studying for many learners. Distance learning involves interaction between students and instructors, and for certain learners the type of interaction common to distance learning can greatly enhance their learning experience. Discussions online, for example, can help ‘people construct their own understanding by actively processing content in order to establish their own meaning’ (Stacy, 1999). Students can actively consider the materials they are studying and develop meaningful contributions to share with classmates. This kind of thinking on collaboration between students developing knowledge through cognitive tasks is termed constructivist theory. For adult learners in particular self-directed learning of this nature can be very effective (Knowles 2012). Equivalency theory is a concept that every instructional designer for distance learning education should keep to the forefront of their minds at all stages of planning and development. The notion of Equivalency Theory dictates that studies at a distance should not be identical to face-to-face education but that ‘equivalent outcomes… should be expected of each learner’ (Simonson et al. 2012, p. 52). For cases such as described in the scenario for this week it is extremely relevant as their can sometime be a tendency to assume just making materials from face-to-face instruction directly available at a distance without any adjustments would be sufficient for effective instruction. Dr. Michael Simonson, in discussing equivalency theory and distance education, admits that the initial thought when converting a course to distance learning can be ‘let’s duplicate that class’, but goes on to explain that the idea of being able to have an identical class at a distance in this way is a ‘fallacy’ (Laureate Education, n.d.c). Courses need to be adapted for distance learning so that students can experience, not an identical, but an equivalent level of education to students who would study solely through a traditional medium. In a case like the scenario we considered for this week the instructional designer should focus on achieving equivalent learning outcomes for the students and not on trying to replicate what has been tried and failed in face-to-face instruction already. Whether instruction is being developed for distance learning students or students studying in a traditional face-to-face setting, a vital part of planning for instructional design is learner analysis. Morrison et al. (2013) state that ‘it is essential… early in the plannign process, to give attention to the characteristics, abilities, and experiences of the learners- both as a group and as individuals’ (p52). An instructional designer should seek to gain as complete an understanding of the learners as a group and individuals as possible before starting the design of the distance learning course. My tip for a designer of distance learning studies would be to pay close attention to the ‘specific entry characteristics’ that would be necessary for a learner to effectively study through distance learning. Successful distance learners typically possess a certain set of attributes that make them suitable for the challenges of studying remotely. It can be an important step for an Instructional Designer to take into consideration whether or not the group of learners in question have the required skillset to take full advantage of distance learning studies, and if not then to take steps to rectify these shortcomings. Wang et al.’s (2008) research suggests that there are four key characteristics that distance learners need to be cultivate to improve their chances of success. These are: 1) the ability to adapt to self-directed learning, 2) learning strategies 3) self-efficacy and 4) learning motivation. To give an example of how learners can be helped develop desirable attributes before their study begins: students can be asked to take a short survey or quiz before the beginning of any design of instruction to gain an understanding of what possible weaknesses they have in any of these four areas, and then an orientation course can be put into place to help improve areas of perceived weakness. Anderson elaborated further on the importance of student-student interaction by stating that ‘work on collaborative learning illustrates potential gains in cognitive learning tasks, as well as increasing completion rates and acquisition of critical social skills in education’ (p57). Thus, if a distance learning module is going to involve interaction between the students, through discussion boards, blog sharing, wikis or otherwise, the importance of interaction between students suggests that the instructional designer should be planning for effective implementation of this from very early on. Students have their own responsibilities for ensuring that the standard of posting in distance-classroom forums is high. However, on the planning and implementation side of things the instructional designer and instructor also have a major role to play in the success of this key area of distance learning. Instructors need to be active members of the learning community. Dr. Piskurich has discussed how it is crucial that distance learning instructors get involved in all class discussions; this needs to be kept in mind by the designer and relayed clearly to instructors (Laureate Education, n.d.d). The instructional designer in this scenario and most other distance learning scenarios too, also need to set very clear expectations for what is expected of students in each discussion. For students to effectively be able to partake in a meaningful and focussed debate with other students it is crucial that the discussion questions ‘clearly define expectations… for each assignment’ (Durrington et al., 2006). One thing I have learned from developing my own instructional courses is that the visual appeal of the classroom and learning resources is critically important. If students are expected to spend time partaking in self-directed learning in the classroom, they need to be visually stimulated by the online environment. Having different types of media to learn from (so not just large amount of text to read), presenting the material in an attractive and user-friendly way, using pictures and diagrams to aid understanding of key issues are just some examples of how the visual appeal of online classrooms can be enhanced. It is a detail that can be easy to overlook but that can have an important positive impact on students’ study experience. Anderson, T. (2008). Theory and practice of online learning (2nd ed.). Edmonton: AU Press. Knowles, Malcolm S., Elwood F. Holton, and Richard A. Swanson, (2012)The Adult Learner: The Definitive Classic in Adult Education and Human Resource Development. 7th ed. Amsterdam: Elsevier. Laureate Education. (n.d.a). Theory and distance learning. Retrieved November 9, 2014, from https://class.waldenu.edu. Laureate Education. (n.d.b). Distance education: Higher education, K–12, and the corporate world. Retrieved November 9, 2014, from https://class.waldenu.edu. Morrison, Gary R., Steven M. Ross, Jerrold E. Kemp, and Howard K. Kalman. (2013) Designing Effective Instruction. 7th ed. Hoboken, NJ: J. Wiley & Sons. 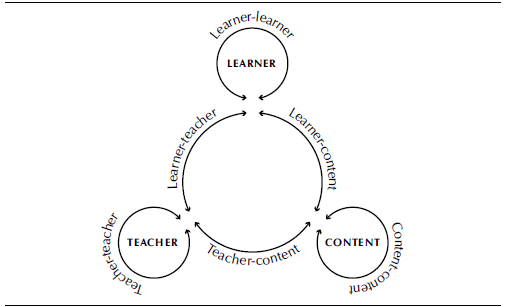 Stacey, E. (1999) Collaborative Learning in an Online Environment International Journal of E-Learning and Distance Education14(2), 14-33. Web. 11 Dec. 2014. < http://www.ijede.ca/index.php/jde/article/view/154/379>. This week I have been analysing Open Courseware websites and considering how much evidence of planning in the instructional design phase can be sensed. Open Courseware involves education institutes sharing course materials for public use (Simonson et al. 2012). The example I used for reference is MIT’S Open Courseware. MIT’s Open Courseware website is very easy to navigate and has very useful features to help you find a course that interests you for study. You can search by topic, sub-topics and specialties to find a suitable course. The course I looked at was a course studying Patents and Inventions. The course description explains that the course covers ‘the history of private and public rights in scientific discoveries and applied engineering, leading to the development of worldwide patent systems’. The course was taught originally by Dr. Robert Rines in autumn 2005. The course on Patent and Inventions was a graduate programme taught through web-facilitated learning. There was one face-to-face lecture of 3 hours each every week. The course features an introduction video interview with the lecturer Dr. Rines, and he gives a useful run-down on how the instruction is offered. Readings for the studies were made available online and then the content was discussed and dealt with in the face-to-face lectures afterwards. Often, the face-to-face classes involved guest speakers from the world of Patents. Dr. Rines explains that the online part of the studies was important ‘to prepare the class for the materials… so that they understand it’ before the face-to-face tuition and guest speakers. It was very interesting to hear Dr. Rines discuss his programme as he touched upon a number of issues that are at the very core of instructional design. For example, he stressed how learner analysis was instrumental in the development of the course. He explains that a lot of the course organisation ‘came from the students’ themselves, suggesting how they would like to learn, what kind of guest speakers they would like to hear from etc. This theme of course development was also driven by the fact that with changes in the Patents and Technology sector the course also needed to be changed with time. Simonson et al. (2012) are very clear on the importance that such continuous evaluation plays in effective instructional design, stating that ‘it is vital to determine what works and what need to be improved’ (p153). Dr. Rines explanation of how the course developed is a clear indication to me that the course was thoughtfully planned, evaluated and then re-evaluated over time. Another important aspect of the course that I appreciated was that it very much encouraged active learning. The course was studied partly through distance and partly on campus, and in cases where distance learning is utilised it is imperative that the instruction ‘engage all the learners in active learning’ to keep students ‘in tune’ (Simsonson et al, 2012, p159). In a section of the course entitled ‘Course Pedagogy’ Dr. Rhines emphasises how important a role active learning plays in the Patents and Inventions programme. He writes the he ‘challenged [his] students to concern themselves with problem areas of their own personal interests, and to do original research anent to submitting analysis and thinking for class discussion’. The course assignments challenge students to think about the required readings they work through online with a view to contributing to discussions in the face-to-face part of the study. I believe there is evidence of planning for distance learning in this approach, as it keeps students engaged and learning actively, even when not physically being together or with the instructor. The final assessment for the course then took the form of a final project that the student would work on privately, develop with discussion in class and present to the class in the final week of study. In conclusion, I was quite impressed with the instructional design of this MIT Open Courseware course. Obviously, the fact that students did meet on campus once a week made learner analysis more manageable, but the continuous development of the course taking into account student feedback was notable and praiseworthy. In addition, the encouragement of active learning and having a course planned with active learning in mind greatly increases the chances of the online resources and remote study being successful. I believe this is a good example of a well-designed wed-facilitated course. MIT Open Courseware (n.d). Course Introduction [Video file]. Retrieved from http://ocw.mit.edu/courses/electrical-engineering-and-computer-science/6-901-inventions-and-patents-fall-2005/syllabus/.